An illuminated reticle eyepiece is virtually indispensable for serious astronomy observing and astrophotography. The Agena 20mm illuminated reticle Plossl eyepiece boasts a double line crosshair laser etched into optical glass that extends from edge to edge. It greatly simplifies centering celestial objects in the eyepiece for more accurate go-to alignments. The illumination is variable, allowing the observer to adjust it for current conditions. It can also be turned off when not needed. The 20mm focal length provides a wide 70° apparent view of the sky allowing you to find objects and alignment stars more easily than shorter focal length eyepieces. With the illuminator turned off, the eyepiece can be used like any other eyepiece for comfortable observing. 4.6 (Based on 51 Reviews) 96% of reviewers recommended this product. 5.0 Exactly What I Hoped For! I was very pleased with the robust, solid feel of this eyepiece and the reticle mechanism. No cheap plastic parts...it feels and performs as a well engineered and constructed product. With dual, focusable and illuminated reticles, you would be hard-pressed not to get a perfect alignment on any star of your choosing. I de-focus and put the "blob" in the box...perfect center alignment ! Ordered this eyepiece to aid in checking polar alignment and drift in preparation for photography. The reticle is works exactly as it should. I provides the lines necessary to improve alignment accuracy. The lighting adjustment is appropriate. That is the dimmest is clear and with a dark sky. The brightest is visible under the street light in front of my house. The medium magnification and the wider field of view make the reticle useful for initial / course measurements. I would echo the opinion that the lines might be a bit closer together. But I would not consider that a negative. It is a feature that requires a different mindset. Another note, with the light off. I don't mind using this eyepiece as a 20mm eyepiece. Nicely made and works well. The crosshairs are a bit wide, but defocusing the target star works well for telescope alignment. The LEDs are very bright and must dimmed all the down. Very well-constructed piece of kit. I would recommend it without hesitation. Very elegant design. I wear glasses (VERY near-sighted) and was concerned that I would not be able to see the double cross-hairs. The integrated focus made this a non-issue. I purchased this eyepiece to use in my finders that use interchangeable 1.25 inch eyepieces. I have used it three nights under dark skies. Each night, I gave up and used another eyepiece. Finders are fast, F/4 is typical, i have three, F/3.75, F/4, and F/4.5. At these focal ratios the eyepiece is poorly corrected, I was not expecting the performance of a 20 mm ES 68 degree but something close to a Plossl would have been nice. i found it barely usable. The second issue is that it requires too much inward focuser travel. My eyes are naturally focused at infinity, it would not focus in my SV-50 finder. In my other two finders which are modified , I was able to achieve focus, just barely. The third issue is that even at the lowest setting, the illuminator is too bright, much too bright. I can see using this eyepiece for alignment purposes, the scope will be slower it will likely have a wider range of focus and the bright illuminator will not be such an issue because it will be used at the beginning of a session. In a finder, the level of off-axis astigmatism is bothersome and the bright illuminator overwhelms fainter stars and may affect dark adaptation. Not only is it great as a finder eyepiece, but it’s a great “go to” EP as well. I use it quite a bit because of its wide field and longer relief. A good item to add to the EP arsenal at a reasonable price. 4.0 I like it a lot! This eyepiece works pretty good. Great for lining up Celestron AVX 8” HD telescope. Only complaints are eye piece is not super sharp and field of view is not as broad as some of my eyepieces; however, I use it mostly just to align telescope. I would recommend this for beginners/intermediates for Nextstar telescope alignment. A very nice eyepiece that works perfectly. 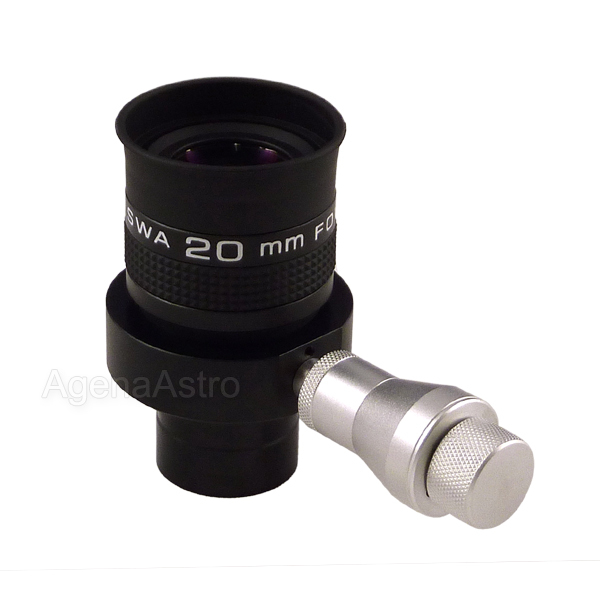 Agena shipped very quickly and the eyepiece arrived in pristine condition. A grrrreat help in centering objects. Especially when using to calibrate my Celestron scope w/StarSense Auto Align. It greatly reduces the guess work in centering an object with traditional eyepieces. I have another eyepiece w/ dual illuminated crosshairs, but I like this one's touch and feel much better. Perfect for alignment of your goto scope as your alignment stars will show in the 70 degree FOV and then you can center them in the duel crosshairs. Does everything it's supposed to and makes it easier to setup and center your scope. Along comes this one from Agena. The lowest setting is perfect, and only illuminates the cross hairs. My alignment process is that much more spot on. Highly recommended. Anyone want to buy a couple of hardly-used reticle eyepieces??? Solid and well made, I like the dual focusable reticle design. Lots of eye relief, and the illumination can be set really low. Definitely worth the higher price than the bargain reticle eyepieces - if you have the budget. Get what you pay for at least in this instance. Worked great, able to dim down to low light setting. Overall good quality. I bought this to help nail my alignment. I wish I bought this much sooner. My goto accuracy has improved and it really takes the guesswork out of the equation. This product is a must have. I purchase quiet a bit from agena and they are great. Pricewise and speedy shipment. Thank you agena! Fine cross-hairs are both easy to see and yet are unobtrusive. A great tool for alignment and guiding. Very nice eyepiece! Optics are great and the illuminator works perfectly. Double crosshair is a nice touch. Although I can't say that the reticle has significantly improved the accuracy of the alignment of my Dobsonian telescope, it simplifies the process and takes out most of the guesswork. The optical quality seems adequate for the purpose, but is not as good as with my Nagler eyepieces. I have been looking for an illuminated reticle eyepiece for a few months. I decided I wanted to get a dual crosshair version and was willing to pay a little more for that. First of all, the order came in just a couple of days, which surprised me. I was able to try the eyepiece out, and it worked great. The crosshairs are a little more spread apart than I expected, but that isn't a bad thing. I was able to more quickly and accurately align my mount. It has a wide view, which also helps alignment go faster. I highly recommend this eyepiece if you need an illuminated reticle. With the illuminated reticle eyepiece, I was able to get my Celestron 8SE aligned very accurately the first. It accurately located many DSO's without need for realignment. I am very pleased. Thanks, i already have recieved this product..I recommend to all. I purchased the EP on the recommendation from a member of the astronomy club to improve my telescope alignment and it has worked like a charm. The ability to adjust the double cross hair light level is very useful. I have found that de-focusing the first star ensures that the star is aligned in the middle of the double cross hair box. I have found that even experienced astronomy people use an EP like this. The only problem I have had is with delivery of the EP. Free shipping can take up to two weeks, even from California to Arizona. I subtracted one star because edge of field is a little too soft for general use. Illumination level variation worked fine and I was able to improve my tracking, which was the reason I made the purchase. Eye relief is a little short but works fine with eyeglasses removed or eyecup rolled down. Review by rcooley of Venice, CA. Bought this to help facilitate telescope alignment. It works like a charm. So simple to center the object with the double crosshairs in this 20mm eyepiece. This has increased the accuracy of my scope's goto's noticeably also simply because it eliminates all the guess work. Really able to dial it in. Highly recommend it! Review by Graekynn of Australia. A fantastic product with great field of view and solidly built. Only minor flaw is the width of the body can interfere with tightening of thumscrews. But thin or long screws easily overcomes this. Review by gpnmoab of Denver, CO.
Let's face it - aligning your telescope is probably one of the most frustrating aspects of this hobby. Accurate alignment must be done with a reticle eyepiece. Trying to center a star without one is just not going to work that well. I have tried the 12mm reticle eyepiece and the field of view on my 8" Celestron even with a focal reducer is just too small and causes even more frustration trying to get a star in the FOV. So, I took the risk and purchased this one. I cannot tell you how much I love this eyepiece. The wide FOV is just what was needed to make accurate alignment a 3 minute job. It is easy to get the star in the FOV on the first attempt. With the 12mm it would take me 20 minutes of absolute frustration and lens swapping and sometimes wanting to give up for the night. The quality is high both in constuction and clairity of the lenses. Not that I would use this eyepiece for viewing, but the stars were so clear I caught myself lingering looking at stars while I was aligning my scope. The crosshairs are wide, but as another person noted, just defocus the star to fill the box and you're good to go. Also you can dim the crosshairs to just a faint lines. Do yourself a favor and do not purchase a 12mm version - Get this one you won't be disappointed. Review by mikeskor of APO, AE. Used to center objects for astrophotography and for alignment of mount. It feels of good quality and sturdy. The reticle crosshairs switch on easily and brightnesss can be adjusted. One possible drawback for some may be that the reticle crosshair lines are rather far apart. However, I overcome this by defocusing the object to make it larger in order to fill the space. Review by Dark Sky Mike of Northern Bruce Peninsula. 5.0 A must have for accurate alignment! I bought this to ensure that alignment on my Celestron Evolution scope was a close to perfect as possible, and this eyepiece does the trick. I love that you can dim the cross hairs as well, and the dual crosshairs make it very easy to ensure your object is centered. Review by Sandy Astronomer of VA. I got the Agena 1.25" Wireless Illuminated Reticle Eyepiece on the advice of another review online. I had recently purchased a push-to telescope and needed help getting the guide stars perfectly in the center of the FOV. This eyepiece did the job perfectly. Easy to use and you are right on the money each time. I know you will not be disappointed if you get it. It is a quality piece, unlike the 'junky' ones other sites peddle. Review by Astrogal of Florida. Illumination wouldn't work consistently. Focusing was poor, crosshairs were too bright or not illuminated. Replaced battery and still wouldn't work. Not returnable after 30 days, so stuck with a heavy eyepiece that wobbles. No instructions come with the eyepiece, including how to change batteries. Spent more time trying to get eyepiece to work than viewing the object. Quality was not equal to the cost. Review by Ron of Stafford, VA. I use this lens in the alignment of my go-to telescope and it greatly speeds up the process. It's well worth the investment. Review by joe4702 of San Diego, CA. This EP has greatly reduced frustration and increased the ease and accuracy of GOTO alignments on my Celestron AVX. I'm using it with an 8" Edge HD SCT. The 20mm FL, 70 degree AFOV gives a decent TFOV with the SCT. Center the star in the box formed by the double reticle. Defocusing the star slightly, to the size of the box, gets you dead center every time, although this really isn't necessary. This is one of my best purchases as far as increasing the ease of use of my set up. Review by Dave of North Carolina. I bought this primarily for use in a finderscope and secondarily for drift alignment of my mount. Basically this is a relatively good quality EP (given the price). Eye relief is good (although not important to me) and the ability to separately focus the crosshairs is nice. I found the range of crosshair brightness to be effective and that is not always the case. My only complaint is that the off-axis performance of this EP (at least in a super fast f3.7 Lumicon SuperFinder) is noticeably poor. But that is the only real flaw that I noticed. 4.0 A Must Have For GoTo Alignment! I was getting weary of switching out multiple eyepieces when aligning my goto and push to go telescopes. I always needed a wider field eyepiece to get the star in the field of view, then center the star, then put in my narrow field of view reticle eyepiece and then align. Then start over with the next star and the wider field of view eyepiece. Now with this SWA 20mm there is no need to swap EPs. The field of view is quite generous and after centering the star in my Telrad (or sometimes the 9x50mm finder), the star is always in the field of view of this 20mm illuminated reticle. The double lines are a bit wider than my previous double cross-hair reticle but that older EP was specifically for drift alignment or guiding. I do not believe this SWA 20mm reticle would be a good option for guiding as the dual lines are spaced a bit too far apart. However for getting that alignment, it is awesome. I actually will defocus the star so it fits within the center square made by the double cross-hairs. The illuminator seems very well built. This EP comes with caps for both ends as well as plug for the threaded opening for the illuminator (keeps the dust out). The only negative comment I have (and it's a really small negative) is that the cap for the eyepiece end does not fit snugly enough. This is the only reason I did not give it 5 stars (I wish I could have given it 4.9 stars). Review by Mark of NJ. Review by Roy G Biv of Westerville, OH. I have a PushTo and a GoTo scope - this eyepiece has significantly increased my alignment accuracy with both scopes. With the double crosshairs, you can really get your alignment stars centered so there is no "fudge factor". And at 20mm - you do not have to switch between a low power to a high power eyepiece. If you have a computerized scope - this eyepiece is a "must have". Review by Child of the Stars of SSI, GA. I use this eyepiece for GOTO aligning and general polar alignment. Nice wide field and the illuminated crosshairs are a must. The only thing that I would suggest is that the double-crosshairs be mounted closer together so that the resultant intersection "square" is smaller. Review by gunfighter48 of Mill Creek, WA. I like the double line reticle, makes centering a star much easier. The wide angle view is just right for my C102GT refractor. Review by peegee of Mississauga, Ontario. Nice 70 degree field is very useful to locate objects. Illuminated reticle eyepieces are rare in 20mm size. Double crosshairs let you see your object when centered. Large subjective lens. Review by Poe of Australia. Review by kcl45 of Suffolk, England, U.K.. I use the illuminated reticule eyepiece predominantly for setting up my Nexstar computerized telescope. It makes the star alignment process far easier and results in a greater accuracy of the Scope's GoTo function once set up. Many reticule eyepieces are not illuminated and are often only 12mm focal length but this one is illuminated and has a wide field 20mm focal length which makes it far better all round. Agena always comes throught with great delivery and communications regarding my purchases. I am very pleased with their service and this purchase was a very nice quality, nice build, and works great. Review by JFD of Tucson, AZ. Foe centering objects in main telescope via the guide scope. Review by NebulaHunter of Palmdale, CA. This Reticle eyepiece has the performance. Long eye Relief, Super wide 70 FOV and a focusing double cross reticle needing for easy guiding!! Review by Kootenaygazer of Nelson,BC Canada. Nice piece for the price. Difficulties when wearing glasses to find the optic sweet spot. Review by Anders of Sweden. Very good for centering objects in Go To telescopes. Review by Slash of Garrettsville, OH. The illuminated double cross hairs takes all the guess work out of your alignment stars. Should have bought this sooner. Fast, precise and easy to use. If you want more precise go-to's and a quicker alignment you need this eyepiece. This is a great eyepiece for alignment of GoTo scopes, especially fast ones. It provides a widefield view in my f/4.7 Dob thus making finding the alignment stars easy. The double illuminated reticle makes centering the alignment star a snap.